In 2007, the Capital Region Collaborative evolved from discussions between ChamberRVA and the Richmond Regional Planning District Commission to launch a regional effort to engage government, business, and community stakeholders in prioritizing and implementing actions that will enhance the quality of life in the Richmond Region. We knew the region did not not need another quick, visioning activity, but instead a sustained collaboration between government, business, and the community. 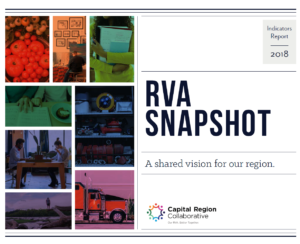 Through a series of 10 focus groups, 85 public conversations, a scientific telephone survey, and an online survey, more than 8,000 voices came together and identified eight priorities for the region – education, workforce preparation, job creation, social stability, healthy community, coordinated transportation, the James River, and quality place. In 2012, we released CRC Building the Framework – a report of our findings. The public was invited to join work groups in each priority area, which were tasked with identifying specific ways that the collaborative efforts of the community, business sector, and government agencies could make a difference in each area. In 2016, CRC launched our Regional Indicators Project as a way to measure progress on economic and social goals. Learn more. We continue to use our eight priority framework to bring together stakeholders in our region. We have action teams for each priority area who use the regional indicators, as well as feedback from the community, original work groups, and specific national best-practice models, to identify strategies to achieve our region’s shared vision.